Emily's Cafe and Catering pairs delicious, artful food with outstanding service. The catering sales team works closely with each and every client to create memorable events that reflect personal tastes and style. 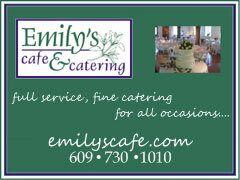 Emily's recommends several unique local venues - indoors and garden oriented, and also arranges elegant tented galas. Seasonal menus include local organic produce!